Are You Stuck in a Gardening Rut? Why use mulch in the garden? Mulch serves many useful purposes, including weed suppression, water retention and heat modulation. It also looks nice. And I’ve lost my supplier for bulk mulch around here, and am feeling slightly bewildered as to what to do next. Ah, mulch. Mulch makes the world go ’round, or at least my world. Why use mulch? Well, can you see the nice newly mulched area in the lower right corner of the picture? The cypress mulch we use around the foundation plantings around our porch just makes the area look so nicely groomed. I love how it looks. More importantly, it’s helped condition the soil. We had our home build a few years ago. If you’ve ever seen a construction site, you know what all that heavy equipment and digging does to the soil. It compacts it and makes it into a desert wasteland. Fortunately, using hardwood mulch can replenish the soil. It breaks down just like a fallen tree would in the forest, and the plant materials turn into lovely compost, which feeds the soil. After 10 years of this, I can actually find worms in my front garden. Hurray for worms! 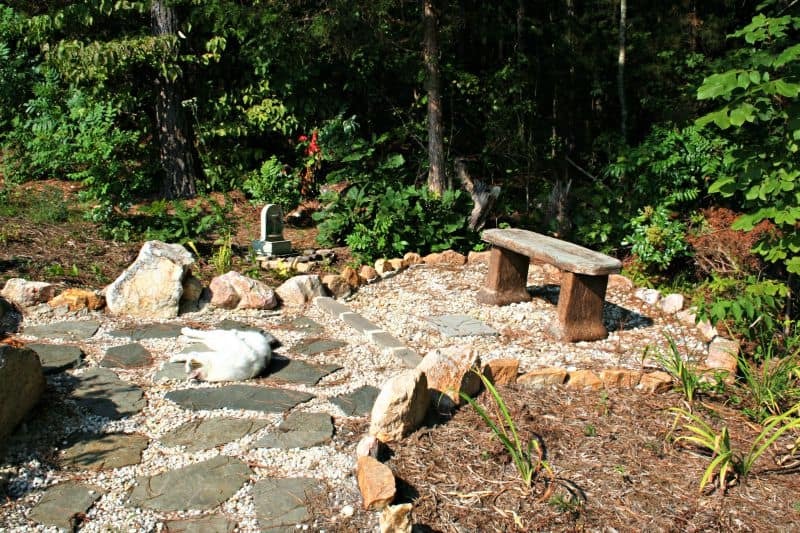 My meditation bench and the freshly mulched shade garden nearby. This is shredded hardwood mulch. Mulch in front of my home isn’t just about appearances. As I mentioned above, the wood chips that we use in this area of the garden have enhanced the composition of the soil. Why use mulch? Let me count the reasons why…. Reduces evaporation. It covers the soil surface so that water stays in the soil, near the plant’s roots. You lose less moisture due to evaporation in mulched areas. Smothers weed seeds. It won’t kill all your weeds, alas, and if the weeds sow their seeds before you place the mulch, it will just grow nicer weeds. But it can suppress some weeds, especially those whose seeds need light to germinate. Regulates temperature. 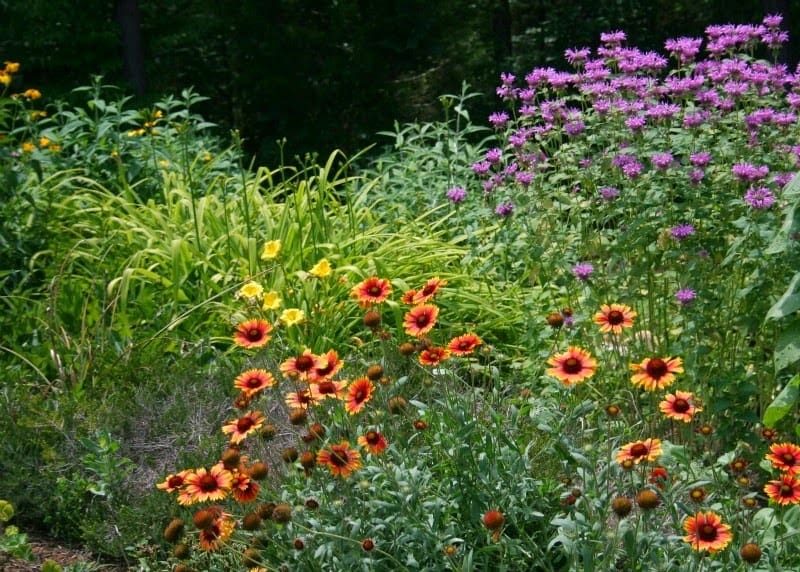 Mulch keeps the soil warmer in winter and prevents thawing and heaving, which can uproot perennials. In the summer, in really hot areas like the one near my sidewalk pictured above, it keeps the soil cooler. In my part of the world, Virginia, that’s very important. Temperatures can soar above 100 F in the dog days of summer, and the reflected heat from the sidewalk slates makes it hot enough to fry an egg. Mulch protects plants from getting scorched. Prevents soil erosion. My area of Virginia also gets windy, especially in the springtime when air from the southern part of the United States meets Canadian air above us (Howdy, neighbors to the north!). This results in gusty winds and thunderstorms throughout the spring. Heavy downpours can wash soil away, and dry soil can be blown away during droughts. Mulch prevents either extreme. 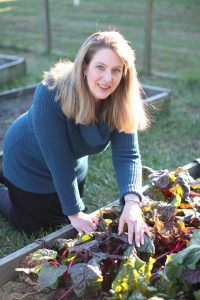 Clemson University’s Cooperative Extension website also has another interesting fact: plants grown in mulched soils have more roots than plants grown without protective mulch covers. I haven’t counted plant roots, but I trust their experts. I also trust the plants who tell me that mulch is good when they grow more roots. That’s the sign of a happy, healthy plant. The brown needle-like things are the remnants of my pinestraw mulch, which protects strawberry plants during the winter. Glass and rubber mulch products are made from recycled materials, so in that sense, they are ‘green’ products. However, they won’t decompose into the soil. They will protect against temperature extremes, weeds and moisture loss, but they won’t feed the soil because they do not break down into nitrogen, carbon and other elements the way plant materials do. Hardwood and wood mulches are byproducts of the lumber industry. Pine mulch is plentiful and inexpensive. Bark, chips or shreds are all fine to use. Make sure that the mulch you purchase is weed-free. Bagged mulch from the garden center is generally of good quality. Watch out for bulk mulch, which may contain weed seeds. Not to gross anyone out, but one memorable bulk mulch delivery here at the farm contained a squirrel tail. Just the tail, not the whole squirrel. We’re still puzzling over that added bit of compost…. Straw and pinestraw mulch are good weed suppressant materials and work well to regulate temperature and retain water in the soil. 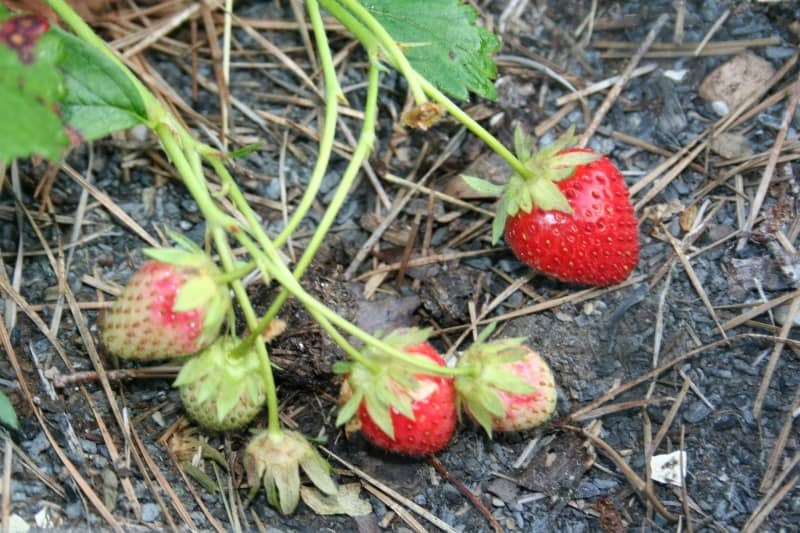 Pinestraw can add acidity, so I only use it on my strawberries over the winter to protect them from frost. Pinestraw is actually pine needles shed from pine trees, raked and bagged. I have all I want, and more thanks to living and working on a 17 acre timber farm. Regular garden straw, such as the kind you buy to make straw bale gardens, should be weed free. It works very well on vegetable garden plants. My perennial garden thrives thanks to mulch. 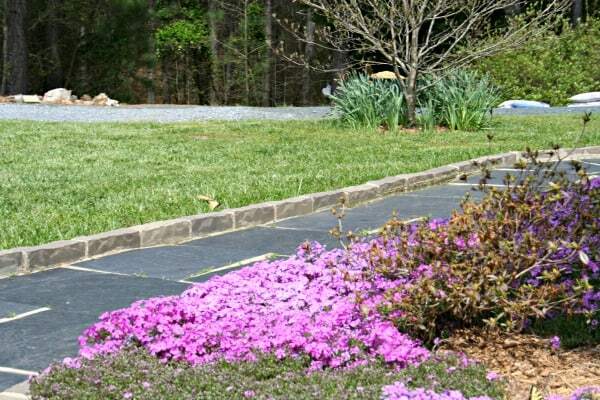 Normally, I buy bagged cypress mulch for the front garden around the foundation, pine bark chips for the rear of the flower garden and the forsythia hedge, and a huge truckload of shredded hardwood mulch from a local supplier. This year, our supplier seems to have gone out of business, so I’ve been asking around for a new source of mulch. We’ve moved most of the old mulch from the front garden into the perennial garden. We rake it up and trundle it across the yard using wheelbarrows. After about three years, which is the last time we’ve tackled this task, it’s almost as good as compost, and makes a find addition to the garden. I include a bit of lime to balance the acidity of the pine and cypress as it breaks down. Now I am on a quest to find my new mulch supplier. This is how I felt back in New York City executive days when I learned my hairdresser had retired to raise her children. Ack! How could she do this to me? Ack! How can my mulch supplier be out of business? Well, there are worse problems to have, I suppose. In the meantime, I am back to mulching the front garden, dodging cats with their oh-so-helpful claws, and pondering the delights of the occasional worm, a sure sign of healthy soil. I hope you enjoyed this introduction to mulch. Happy gardening, and keep growing! I didn’t know that mulch smothers weed seeds and helps suppress the weeds growth. In my garden there are a bunch of weeds that I cannot seem to keep under control. I bet putting mulch in will help eliminate the weeds while also helping my garden to grow. I wonder if there is a way to have large amounts of mulch delivered so I don’t have to transfer it from my car. I had no idea that mulch is useful to regulate temperature. My mom loves to plant a vegetable and flower garden each year. Every year I go with her to pick up a couple bags of mulch to put in them. I had always thought that it was so make the soil more rich to promote growth. I’ll have to ask her if she knew about this benefit as well.